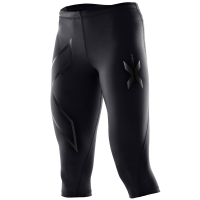 To ward off leg fatigue and soreness during training or racing, look no further than the 2XU Women's Thermal 3/4 Compression Tights. Made with PWX technology, and brushed to keep you cozy, these tights will keep you feeling fresh so you can train harder longer...even if it's a little chilly out. . High power denier offers support to hamstrings, quads, abductors, and glutes to reduce muscle fatigue damage. PWX compression fabric features high grade elastomeric yarns and a superior grade knit structure to allow 360deg stretch for optimal flexibility and movement; brushed to provide a softer, warmer feel on your skin. 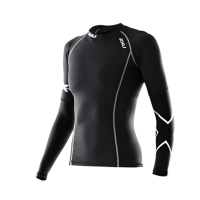 Allows for greater regulation of your core body temperature to enhance comfort and warmth during cold-weather training. Graduated fit promotes increased circulation to move more oxygen to your muscles, flush out lactic acid more efficiently, and speed recovery. Flatlock seam construction ensures absolute comfort. UPF50+ keeps you protected from the suns harmful rays.